Today we added low-IFR charts to CloudAhoy, making it easier to debrief XC IFR flights. 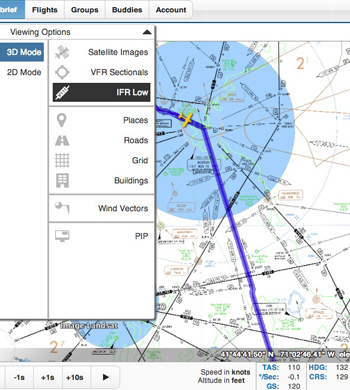 To overlay a flight on an IFR chart, select the IFR option from the debrief’s top bar. IFR charts are available on CloudAhoy Standard. Thanks for this blog. IFR charts looks not available for France either for CloudAhoy Standard version ? Any option or ongoing development to add OACI charts ? Regards. We’re working on it. Coming soon.